I'm not exactly sure who was the innovator of the mysterious green mist in the world of wrestling. I believe it's a tradition that started in Japan and the first wrestler I remember seeing do it was the Great Kabuki in World Class Championship Wrestling. According to some sources, Kabuki was the first to do it, so I guess my recollection is accurate. Kabuki was managed by Gary Hart and would spray the mist in his opponents eyes to get an unfair advantage. The top baby faces in the company experienced a blinding from time to time against Kabuki. 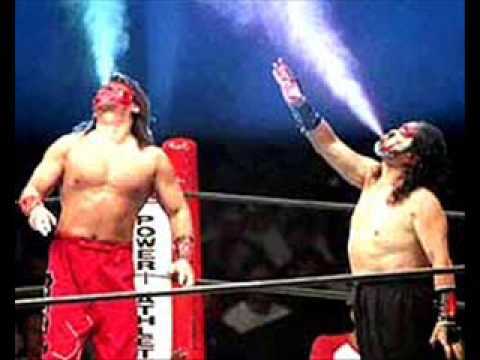 Then he and Hart split and Sunshine took over the contract of Kabuki and the bad guys were sprayed. For me, one of the most memorable moments during his face run was spraying One Man Gang in the eyes after Gang wrapped a chain around Kabuki's neck and lifted him off the mat. Kabuki passed the mist tradition on to his son, the Great Muta. He too would spit in the eyes of his opponents, sometimes during the match, sometimes it came after. Muta used it in contests against Sting, Ric Flair and Arn Anderson. Before Muta's mist debut in WCW, Killer Khan was spraying opponents in WWF rings in 1987. For some reason, a match with Outback Jack sticks out to me with Khan using the mist. He also battled Hulk Hogan for the WWF Championship and while researching this piece, I found the plan was for Khan to spray mist in Miss Elizabeth's eyes to set up a feud with "Macho Man" Randy Savage. An interesting idea, but I like the Honky Tonk Man angle better. Long after Khan left WWF, Tajiri showed up in WWE and kept up the mist spraying tradition. Black mist was used by the Superstar and Nidia ended up going "blind" after a shot. Various colors were used during this time and I found on a Wiki fandom site a breakdown of the implications of each color. Green- The commonly used mist which is said to obstruct the opponents vision. Red- Quite often used but is said to Burn the eyes. Used by Gangrel which was known as Blood Mist. Black- Said to blind the opponent for several weeks. Blue- Sends the opponent to sleep. Purple- Cause momentarily distraction and memory loss (once used by Roxxi Laveaux).